SIMI VALLEY, Calif. -- One is a monument to what today's imagination can do on difficult terrain -- a Tilt-O-Whirl journey of elevation changes, grassy targets and inspiring scenery. 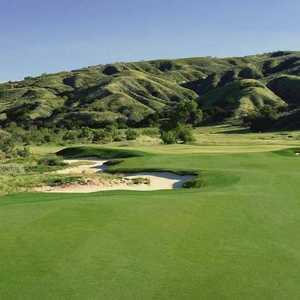 Lost Canyons Golf Club offers 36 holes of jaw-dropping golf designed by Pete Dye with consultant Fred Couples. 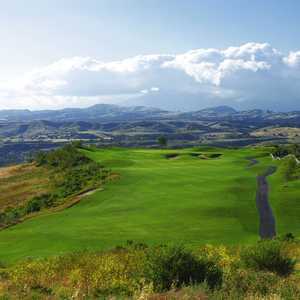 Golf courses in Simi Valley, Calif. Golf courses in Moorpark, Calif. This is Lost Canyons Golf Club -- ritzy, fancy schmancy and loaded with celebrities. Eric Dickerson and Marcus Allen, Hall of Fame NFL running back types, might just be in the foursome ahead of you. And it will set you back more than $100. The other, Rustic Canyon Golf Club, is a trophy dedicated to the golden days of traditional architecture. Old-style minimalist routing follows the lay of the land and earth moving was almost non-existent. Bubba in blue jeans might just be in the foursome ahead of you. But Bubba will also be playing on a national award-winner. Rustic Canyon, designed by Gil Hanse, won Golf Digest's 2002 Best New Affordable Course in the USA. Lost Canyons and Rustic Canyon are just 45 miles northwest of downtown Los Angeles on Highway 118 and are separated by the ridges and peaks of the Santa Susana Mountains, just minutes apart, but they are world's apart in styles. 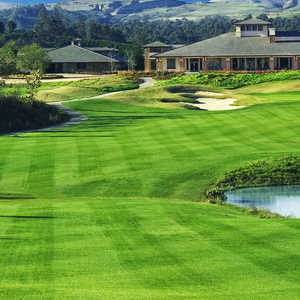 Rustic Canyon, located in a hiker's paradise called Happy Camp Canyon Regional Park, is a Moorpark gem that the purists of golf architecture drool over. It measures 6,906 from the back tees at par of 72 and has hosted qualifying for the Southern California Amateur Championship. Strategically intense is how lead architect Hanse described this instant classic. "It gives players various options and has plenty of width. The better player, who is really trying to score low, will see a much tighter course because he wants to be in the correct fairway position to have a good angle to the hole." Rustic Canyon is characterized by huge tightly mown areas encircling the greens. "This gives the average player more opportunity to score because he can putt, chip or play bump-and-run shots from off the green. It also creates indecision for the better players," Hanse said. The front nine plays fairly flat and is very walkable. Then the back nine climbs into the hillside and its canyons. There's a major-league forced carry from the back tees on No. 14, a 480-yard, downhill par-4. A lot of wannabe single-digit types will leave this hole with a six. The course hosted 36,000 rounds in its first year, but national publicity could increase that to more than 60,000 rounds in its second year of operation. Book tee times way in advance, it's popular and affordable, but very busy. Designed by Pete Dye with consultant Fred Couples, Lost Canyons has 36 scenic holes. The Sky Course at Lost Canyons was the first of two jaw-dropping layouts to open in 2000, and was followed by the Shadow Course in 2001. Many high-handicappers call it Lost Balls Golf Club. This is the guy who sees green and tan. Hit it toward the green areas. The tawny fringes are big trouble. "When I play here I find myself looking at just about everything but the fairways," Couples said. The mountain panoramas are big. Dye said it was the best suited and the most naturally beautiful land that he had ever had the opportunity to design a course on, let alone two. The Sky Course, located in the Tapo Canyon County Park area, gets its name from the views of the mountains framing the blue sky. It follows canyon-ridge lines and offers countless Kodak moments. The Sky Course, 7,250 yards at par 72, was honored in Golf Magazine's Top 10 of 2001. The Shadow Course at Lost Canyons, 7,005 yards at par of 72, bumps up against White Face Mountain and travels the rolling canyon floor. You will witness Dye's trademarks everywhere -- huge, deep pot bunkers and forced carries, up-and-down holes and wild country off the fairways. Flat lies are hard to come by and the wind often blows hard. But the service is first class and the facilities are second to none. Any day of the week don't be surprised to see Hollywood stars, rock musicians or professional athletes. Be sure to watch for the old west artifacts around the courses and recall the days when the TV serial Little House on the Prairie was filmed nearby.